Spirals & Spatulas: Candy is Dandy. I've been super productive with wedding things lately...but mostly with bridesmaid gifts. Which I can't talk about here. Because they read the blog. And you know, I want them to be surprised and stuff. But don't worry...I think I'm going to schedule a post about it to go up while I'm honeymooning in Jamaica, so you can hear from me even while I'm in the land of drug lords and violence (and palm trees and butlers that bring you drinks). I had this written on my to-do list: "Figure out candy buffet stuff." And boy oh boy...I figured it allllll out! So I started with 8 pretty jars. I have been accumulating these for months and months from places like TJ Maxx, Marshalls, Hobby Lobby on 50% Glassware Week, and Pier One's Clearance Aisle. Click to enlarge! These are all my jars (set out on my parents' pool table, which my dad was thrilled about). I also have 5 of these bubble bowls, leftover from that sorority event I organized, and I'm using two of them (you know, so I have an even decade of 10 jars. Because I like things to be even). I already shared with you what kinds of candy will be filling my ten jars. In that mock up photo above you can see my York peppermint patties and the Twizzlers bites in a couple of the jars. A while back I bought 200 cellophane bags from CelloBags.com. They're 4.75'' by 6.75'' and safe for food and all that jazz. I went with a fairly small size to sort of "limit" how much candy disappears from the jars. There will be a bunch of kids at the wedding, and I figure if I provide them with huge bags they'll probably fill them to the brim and leave no Gummi Sharks for the old folk. I paid $17.15 for 200 bags (including shipping). They do carry cello bags at HobLob in packages of 50 for $5, but they're the big kind like you use for little kids' birthday party goodie bags. And I'm a perfectionist, and I wanted smaller bags! Plus I saved like three dollars. Score. I also ordered 5 aluminum scoops from Scoops-Scoops.com (Yes, there is a website entirely dedicated to SCOOPS!). I had SUCH a hard time deciding which size to get, but I went with the 5 oz ones and they're PERFECT. So if you're planning a candy buffet, go with 5 ounce scoops, okay? Trust me, I wouldn't steer you wrong! Also, buy them from that website. It's the cheapest place. Believe me, I looked everywhere. They were just $2.42 each! Oh, and I have one pair of aluminum tongs. Can't leave out the tongs! My mom picked them up at Target for me. They're for those Gummi Sharks. 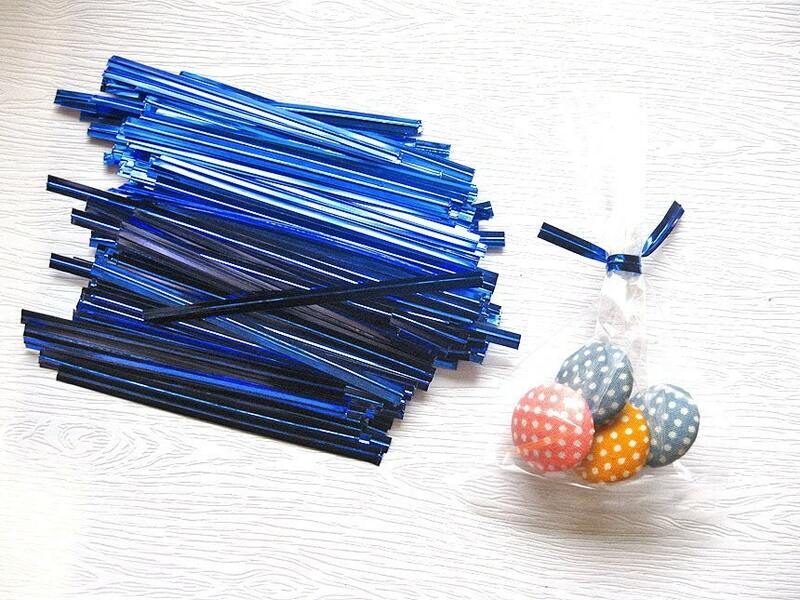 Also, I bought 200 dark blue metallic twisty ties from Taiwan! Yes, I am insane. And no, they don't sell dark blue metallic twisty ties in the United States. I found the Taiwanese twisties on Etsy from seller heydaysupplies, and a week later they arrived at my doorstep. Just $2.50. And only $2.00 for shipping. Totally worth it. The last supplies to arrive at the Candy Buffet Party were the stickers. 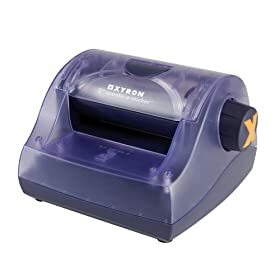 By "stickers" I mean paper that has taken a trip through my Xyron. I love that thing. I designed them in PowerPoint (my design program of choice, ha! ), printed them out as slightly-too-large circles, and punched them with a 1.75'' scallop punch. Post-punching, the scalloped circles took a trip through my Xyron 500 and emerged as stickers (which I promptly stuck onto the cello bags)! Xyron-stickered bags and Taiwanese twisties. A match made in DIY heaven. So now I'm just waiting for the candy to arrive. When it gets here I'll whip up some cute jar labels and try it all out...stay tuned!